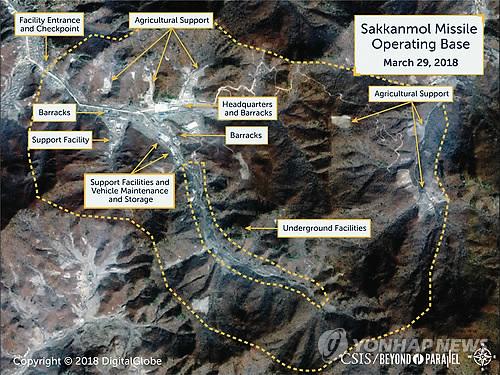 The report by the Center for Strategic and International Studies (CSIS) singled out the Sakkanmol missile base 85 kilometers north of the Demilitarized Zone, stating that it’s now equipped with short-range ballistic missiles capable of reaching much of Japan and anywhere in South Korea. Sakkanmol “could easily accommodate more capable medium-range ballistic missiles,” the report said. Speaking on Nov. 13 about the report, Blue House spokesman Kim Eui-Kyeom pointed out that the source of the Sakkanmol analysis is a commercial satellite. “The intelligence authorities of South Korea and the U.S. have far more detailed information from military satellites and are closely monitoring (it),” Kim said. The spokesman said the facilities have nothing to do with intercontinental ballistic missiles (ICBMs) or intermediate-range ballistic missiles (IRBMs) and he also took issue with a related New York Times report headlined, “In North Korea, Missile Bases Suggest a Great Deception”.